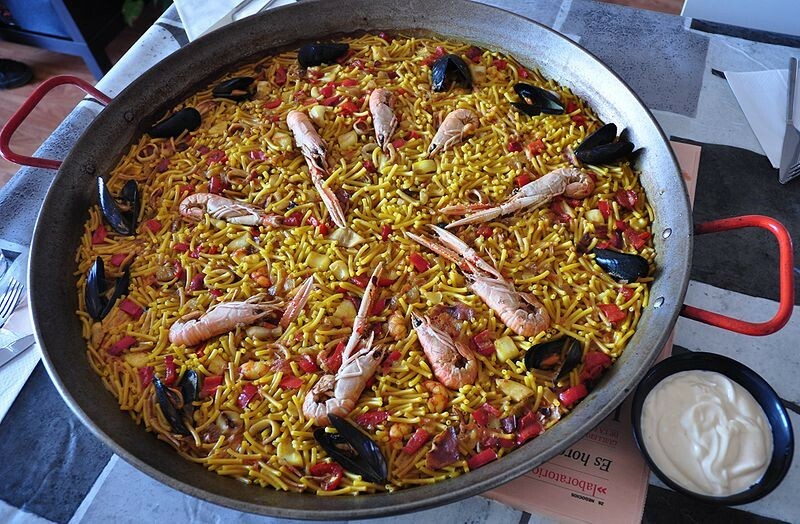 The fideuá is another typical dish that is made in Valencia paella (in the same pan in which paella recipe is made). This is a noodle dish with seafood. You could say that this is a seafood paella with noodles instead of rice. The fideua was invented in the coastal city Gandia. Legend has it that some fishermen from Gandia wanted to make a seafood paella on their boat but they forgot the rice. This is a delicious dish without meat. 2 ripe tomatoes – grated with a cheese grater. Fry the 300g of uncooked prawns (don’t remove anything from these prawns as they only contribute to the stock) in a deep source pan with the extra virgin olive oil until they are well cooked and the oil takes on a rich colour, be careful not to burn them, but squash the heads with a fork as you are cooking them, this will help release all the flavour. Now fill the pan with water and put in the rest of the ingredients, adding the wine once the stock is boiling and simmer for two and a half hours. Scoop off the foam that rises to the surface of the stock during the first half hour until no more appears, season with salt if necessary, and then once finished pass the stock through a fine sieve twice and put to one side. Add the 500g of Fideuá pasta (or small elbow macaroni or short noodles) stir in and spread the pasta around the pan. From this point onwards all you have to do is once the stock has almost evaporated, add another ladle or two of stock, move it all around with a large spoon and let it almost evaporate and then do it again. Keep doing this until the pasta is cooked and ready to eat. Add the stock little by little. When the pasta is almost cooked put the seafood back in and spread over the top of the pasta. Once the pasta is ready you want it to be left with hardly any stock, wet and moist, not liquid stock, don’t let it dry out completely though. When you remove it from the heat and let it sit for a couple minutes the final stock left over will reduce a little further and thicken as it cools slightly. Thank you to www.eyeonspain.com for this recipe.